The Library of America presents Smith's finest work in the new collection, American Pastimes: The Very Best of Red Smith. It is available now and a must-read for all sports fans, young and old (and an ideal gift for Father's Day). This week, with permission from Smith's family, we'll reprint a Red Smith column every day to offer you a sample of what he was all about. Today's column is "Night for Joe Louis" which ran on October 27, 1951, the day after 27-year old Rocky Marciano knocked out 37-year old Louis. Joe Louis lay on his stomach on a rubbing table with his right ear pillowed on a folded towel, his left hand in a bucket of ice on the floor. A handler massaged his left ear with ice. Joe still wore his old dressing-gown of blue and red—for the first time, one was aware of how the colors had faded—and a raincoat had been spread on top of that. This was an hour before midnight of October 26, 1951. It was the evening of a day that dawned July 4, 1934, when Joe Louis became a professional fist fighter and knocked out Jack Kracken in Chicago for a fifty-dollar purse. The night was a long time on the way, but it had to come. Well, except that this time he was lying down in his dressing-room in the catacombs of Madison Square Garden. Memory retains scores of pictures of Joe in his dressing room, always sitting up, relaxed, answering questions in his slow, thoughtful way. This time only, he was down. His face was squashed against the padding of the rubbing table, mulling his words. Newspapermen had to kneel on the floor like supplicants in a tight little semicircle and bring their heads close to his lips to hear him. They heard him say that Marciano was a good puncher, that the best man had won, that he wouldn’t know until Monday whether this had been his last fight. He said he never lost consciousness when Marciano knocked him through the ropes and Ruby Goldstein, the referee, stopped the fight. He said that if he’d fallen in mid-ring he might have got up inside ten seconds, but he doubted that he could have got back through the ropes in time. They asked whether Marciano punched harder than Max Schmeling did fifteen years ago, on the only other night when Louis was stopped. Joe’s eyes got sleepy. “Ugh,” he said, and bobbed his head. The fight mob was filling the room. “How did you feel tonight?” Ezzard Charles was asked. Joe Louis was the hero of Charles’ boyhood. Ezzard never wanted to fight Joe, but finally he did and won. Then and thereafter Louis became just another opponent who sometimes disparaged Charles as a champion. “No,” he said, with a kind of apologetic smile that explained this was just a prize fight in which one man knocked out an opponent. “How did you feel?” Ray Arcel was asked. For years and years Arcel trained opponents for Joe and tried to help them whip him, and in a decade and a half he dug tons of inert meat out of the resin. “I felt very bad,” Ray said. It wasn’t necessary to ask how Marciano felt. He is young and strong and undefeated. He is rather clumsy and probably always will be, because he has had the finest of teachers, Charley Goldman, and Charley hasn’t been able to teach him skill. But he can punch. He can take a punch. It is difficult to see how he can be stopped this side of the heavyweight championship. It is easy to say, and it will be said, that it wouldn’t have been like this with the Louis of ten years ago. It isn’t a surpassingly bright thing to say, though, because this isn’t ten years ago. 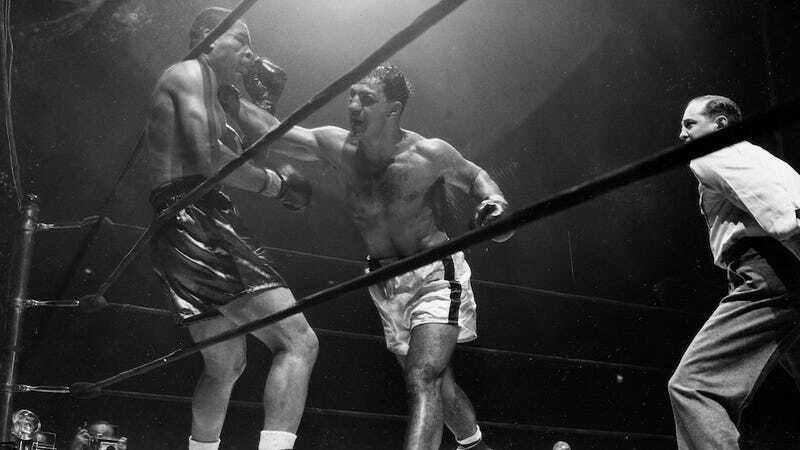 The Joe Louis of October 26, 1951, couldn’t whip Rocky Marciano, and that’s the only Joe Louis there was in the Garden. That one was going to lose on points in a dreary fight that would have left everything at loose ends. It would have been a clear victory for Marciano, but not conclusive. Joe might not have been convinced. Then Rocky hit Joe a left hook and knocked him down. Then Rocky hit him another hook and knocked him out. A right to the neck followed that knocked him out of the ring. And out of the fight business. The last wasn’t necessary, but it was neat. It wrapped the package, neat and tidy. An old man’s dream ended. A young man’s vision of the future opened wide. Young men have visions, old men have dreams. But the place for old men to dream is beside the fire.